Epicurus was a famous Philosopher from Greece, who lived between 341 BC and 271 BC. Founder of the philosophical direction epikureismen. He was born on the island of Samos, the son of an Athenian teacher. Only a few fragments and letters have been preserved by Epikurs estimated 300 written works. Much of what is known about Epicurus derives from later followers and commentators. For Epicurus philosophy was intended to achieve a happy, tranquil life, characterized by ataraxia, peace and free from fear, and aponia, absence of pain, and by living a self-sufficient life surrounded by friends. He taught that pleasure and pain are the measuring sticks for what is good and evil, that death is the end of the body and soul and therefore there was nothing to fear, because the gods are not rewarded or punished the people, and that the universe is infinite and eternal and that events in the world is ultimately based on the movements and interactions between atoms moving in a vacuum. 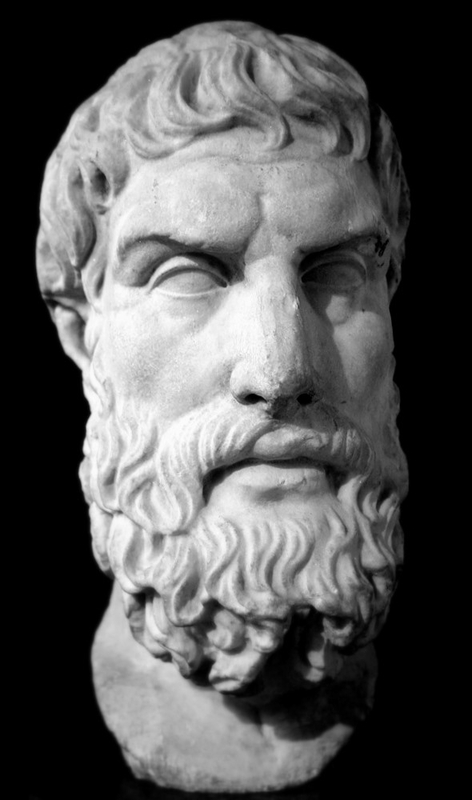 Our collection contains 27 quotes who is written / told by Epicurus, under the main topics: Death, Men, Power. "Misfortune seldom intrudes upon the wise man; his greatest and highest interests are directed by reason throughout the course of life"
"Justice... is a kind of compact not to harm or be harmed"
"It is possible to provide security against other ills, but as far as death is concerned, we men live in a city without walls"
"It is not so much our friends' help that helps us, as the confidence of their help"
"It is impossible to live a pleasant life without living wisely and well and justly. And it is impossible to live wisely and well and justly without living a pleasant life"
"It is better for you to be free of fear lying upon a pallet, than to have a golden couch and a rich table and be full of trouble"
"If thou wilt make a man happy, add not unto his riches but take away from his desires"
"If God listened to the prayers of men, all men would quickly have perished: for they are forever praying for evil against one another"
"I would rather be first in a little Iberian village than second in Rome"
"I never desired to please the rabble. What pleased them, I did not learn; and what I knew was far removed from their understanding"
"I have never wished to cater to the crowd; for what I know they do not approve, and what they approve I do not know"
"Do not spoil what you have by desiring what you have not; remember that what you now have was once among the things you only hoped for"
"Death does not concern us, because as long as we exist, death is not here. And when it does come, we no longer exist"
"A free life cannot acquire many possessions, because this is not easy to do without servility to mobs or monarchs"
"You don't develop courage by being happy in your relationships everyday. You develop it by surviving difficult times and challenging adversity"
"We do not so much need the help of our friends as the confidence of their help in need"
"There is no such thing as justice in the abstract; it is merely a compact between men"
"The time when most of you should withdraw into yourself is when you are forced to be in a crowd"
"The misfortune of the wise is better than the prosperity of the fool"
"The greater the difficulty, the more the glory in surmounting it"
"The art of living well and the art of dying well are one"
"Skillful pilots gain their reputation from storms and tempest"
"Riches do not exhilarate us so much with their possession as they torment us with their loss"
"Of all the things which wisdom provides to make us entirely happy, much the greatest is the possession of friendship"
"Nothing is enough for the man to whom enough is too little"